The french translation for the title of the multimedia slide has a mistake. Hum, it’s strange, I can’t find this error of translation. :$ Is it really in the package « ubiquity-slideshow-ubuntu » ? Found ! 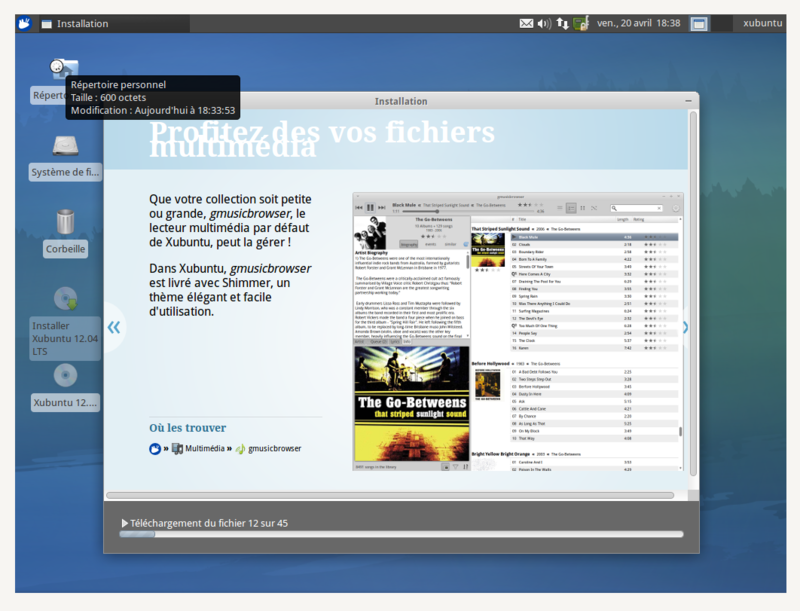 In the package « ubiquity-slideshow-xubuntu ». > Status changed to 'Confirmed' because the bug affects multiple users. > French Translators, which is a bug assignee. Only you can write in the case entitled « Current French » ? Yes I think it would be better too. However, I am not sure to understand your question about "current french" ? > Only you can write in the case entitled « Current French » ? I meant : who can wrote in the case « Current French » ? Indeed, I only can propose a suggestion, not write in this case. I also fixed the 'des vos fichiers' into 'de vos fichiers'. However, there is another problem: the string is so long that it makes 2 lines and the last word is above the 1st line. We should find a shorter translation so that it fits in 1 line only. What about "Profitez de votre multimédia" or "Profitez du multimédia" ? It is not the only slide to have the 2 lines crossing problem. Why not asking for the size-font to be reduced and/or the line-height to be increased ? Your shorter suggestion is good. As the english is "Enjoy your media", the translation could be "Utilisez vos médias" as well. We'll then choose the best one on the ubuntu-l10n-fr mailing-list. @yoboy : I thought exactly like you but in fact we should only translate the original text "Enjoy your media" because these tranlsations can be used in others contexts. Maybe a good solution is to adapt the original text with the background : Listen to music!